The Governor has declared a State of Emergency due to multiple wildfires. To learn more about the fires and explore additional recovery resources, please visit www.wildfirerecovery.org. 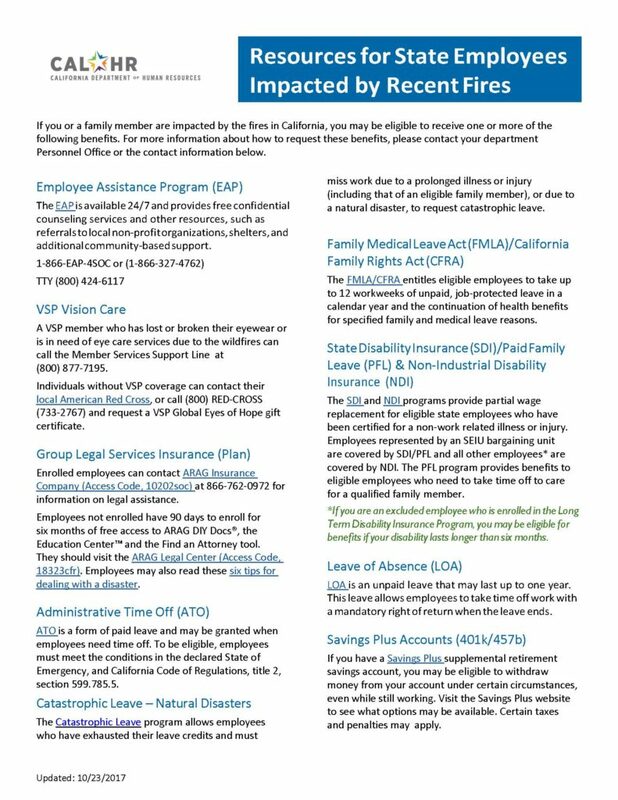 Resources for impacted state employees are listed below along with information to track air quality in California. Good Air quality is satisfactory and poses little or no health risk. None. Moderate Air Quality is acceptable for most. There may be moderate health concern for a small number of sensitive people. Unusually Sensitive people should consider reducing prolonged or heavy outdoor recreation. Unhealthy for Sensitive Groups(USG) Increasing likelihood of respiratory symptoms in sensitive individuals, aggravation of heart or lung disease and premature mortality in persons with cardiopulmonary disease and the elderly. People with heart or lung disease, children and older adults should avoid all physical outdoor activity. Unhealthy Increasing aggravation of heart or lung disease and premature mortality in persons with cardiopulmonary disease and the elderly; increased respiratory effects in general population. People with heart or lung disease, older adults, and children should avoid prolonged or heavy exertion. Everyone else should reduce prolonged or heavy exertion. Very Unhealthy Increasing aggravation of heart or lung disease and premature mortality in persons with cardiopulmonary disease and the elderly; increased respiratory effects in general population. People with heart or lung disease, older adults, and children should avoid prolonged or heavy exertion. Everyone else should reduce prolonged or heavy exertion. Hazardous Significant aggravation of heart or lung disease and premature mortality in persons with cardiopulmonary disease and the elderly; significant increase in respiratory effects in general population. People with heart or lung disease, older adults, and children should avoid all physical activity outdoors. Everyone else should avoid prolonged or heavy exertion. This AirNow page (by US EPA) displays individual air monitoring sites and the hourly average particulate matter (PM) reading for each monitor. This AirNow page provides a composite California map of air quality hazard for PM and ozone (O3) combined. It is also updated hourly. This is the map that CDPH recommended for the UCG report. It also provides descriptions of the health risk levels, corresponding to the table below, as buttons below the map. This page provides AQ forecasts based on the US Forest Service AirFire model, not current air monitoring readings. It also provides site-by-site rolling 24-hour AQ histories that are informative. Magellan will provide free, confidential counseling services and other resources, such as referrals to local non-profit organizations, shelters, and additional community-based support to assist individuals in California as they work to cope with the feelings of fear, sadness, anger, and hopelessness related to these kinds of natural disasters. The toll-free number, for public at large, to access free, confidential counseling services is 1-800-327-7451. As a reminder, state employees can find information on fire resources on EAP website home page at http://www.eap.calhr.ca.gov/members/wildfire-resources.aspx and can call EAP toll free number (1-866-327-4762) to access services any time of the day or night.